From Horseshoes to Steel Sales | Pottinger Steel Works, Inc.
R. B. Pottinger Steel Works was founded in 1898 by Robert B. Pottinger as a horse shoeing and general blacksmithing shop. Pottinger, who arrived in Racine from Scotland in 1891, started the firm as a part-time business while employed at the J. I. Case Plow Works. Rapidly growing demand for his services forced Pottinger to leave Case and work full-time at his blacksmithing business. With the arrival of the “horseless carriage,” the demand for horseshoeing began to fall off, causing the firm to look elsewhere for business. Pottinger started moving into steel sales and heat treating while still maintaining a forge to do odd blacksmithing jobs. In 1945, Mr. Pottinger died while working at his forge, passing ownership to his daughters and son-in-law, Hester Pottinger and Mr. and Mrs. Christopher Prentice. 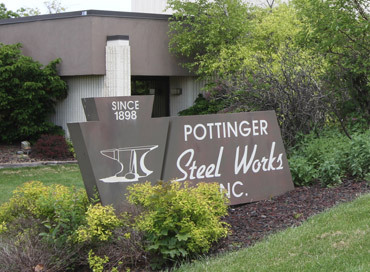 The business boom brought about by World War II caused another change in Pottinger Steel. The company sold its heat treating furnaces to buy metal cutting equipment and started specializing in steel sales. Although seldom used, the original forge was kept functional into the mid-1950's. The Pottinger family owned and operated the company until July 1, 1970, when it was purchased and incorporated by Eugene F. Rinehart. From this date to the present, the corporation has experienced steady growth, adding new product lines and offering more services. The company is currently still in the Rinehart family and is being operated by Eric, Kim and Matt Rinehart. 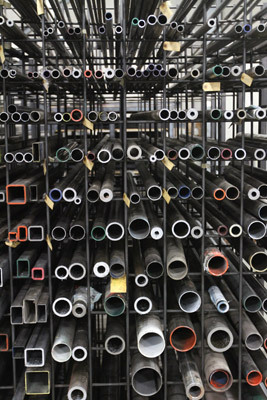 It is the intention of the employees of Pottinger Steel to continue to grow and strive to improve as a supplier of metals and service to its customers.